This is another romantic comedy/drama film that I really love. 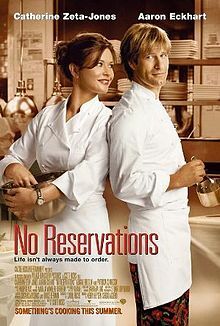 Catherine Zeta-Jones (Kate Armstrong) and Aaron Eckhart (Nick Palmer) in the two leads are just great together, while cooking up some sizzling dishes and a delicious story to boot! The movie gets a bad rap though, for being a rip off of the German film Mostly Martha, but hey, I suppose you can't please everyone. I personally love NR and the only downside after watching this film is that I end up hungry for some yummy food, LOL. Kate: I can't believe I'm actually paying for these suggestions. Kate: So I've got one for you. What are the three secrets of French cuisine? Nick: Oh, come on. Everybody knows that. Kate: Oh, yeah? So, what are they, smarty-pants? Nick: Butter, butter and butter. Anyhow... who else liked this movie? Get posting and have fun!